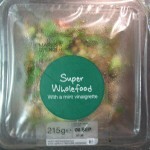 This isn’t my favorite salad in the M&S Super Wholefood line. 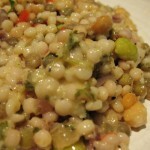 It has loads of healthy stuff–edamame, chickpeas, pumpkin seeds, lentils–but it’s just not as flavorful as their other salads. As advertised, it’s very minty, but that’s all I wrote while taking my tasting notes. It would make a nice side salad for some roast lamb, I think. On its own, meh.